Kathleen Kelley of Falls Church spoke to us at the Tysons pit stop on Bike to Work Day, telling us that she commutes daily from her home to Tysons. She said that she rides because it is way more fun than driving. 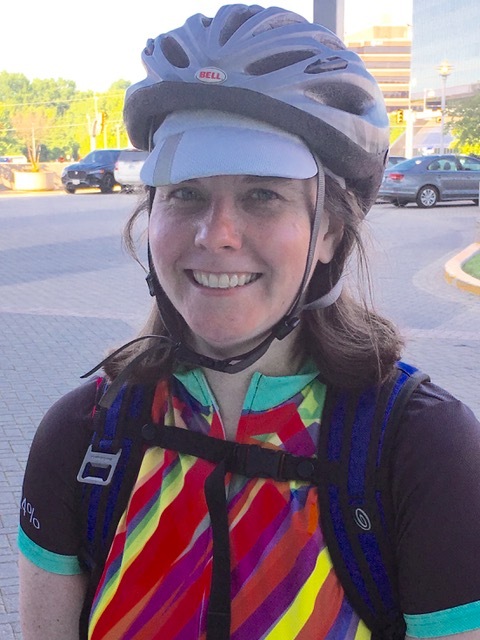 In addition to her daily commute, she has a few favorite routes she rides to Shirlington and around the Harper’s Ferry area. Kathleen told us that one of the things she likes most about bicycling is the friends she has made over a common love of biking. Kathleen would like to see better transportation planning to correct car-centric networks such as is found in and around Tysons. The good news is that a number of projects are underway in the Tysons area that address Kathleen’s concerns. For example, shared use paths on both sides of Route 7 from Tysons to Reston Avenue are included in the Route 7 widening design. And grade separated ramp crossings for the Route 7 bridge over the Dulles Toll Road are under construction. The 14-foot-wide shared-use path being built for pedestrians and bikes as part of this project will tie into future trails.